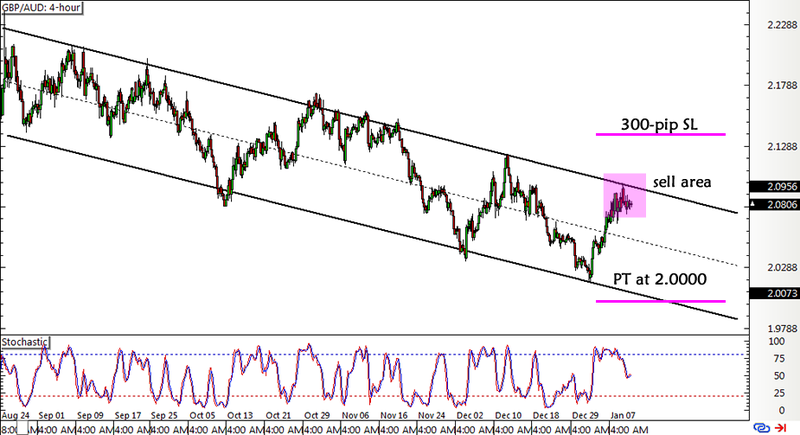 Check out this neat descending channel on GBP/AUD’s 4-hour forex chart! I’m tempted to hop in at market but I figured I’d see if the fundamentals line up first. I know I’ve mentioned in my previous trade post that I’m maintaining a bearish Aussie bias, but I’m also thinking that the pound is in for more weakness. And with the top-tier catalysts lined up from the U.K. this week, it looks like this pair has some room to fall. BOE Governor Carney might throw in another set of downbeat remarks during their upcoming policy statement on Thursday, with policymakers likely highlighting the risks from weak commodity prices and the slowdown in China. The U.K. central bank’s switch to a less upbeat stance resulted to steady declines for the pound towards the end of 2016 so I’m thinking that their announcement and meeting minutes might have a similar effect this week. As for technicals, I’m eyeing a sell area around the top of the descending channel somewhere between 2.0800-2.1000. I’ll be setting a pretty wide stop loss for this one since it’s a volatile pound pair and I’ll be aiming for the bottom of the channel at 2.0000. I haven’t set any actual entry orders yet but I’ll be ready to hop in by Thursday, especially if the Australian jobs report comes in stronger than expected. If not, I’ll wait for another opportunity to short during or after the actual BOE events. I’ll keep y’all posted!